Vicksburg was even more quiet in the morning than the evening before. We found a quick bite and checked out a local gallery called The Attic before we slid back onto the River Road, headed north for Memphis. Just before leaving the town limit of Vicksburg there is a place called “Margaret’s Grocery“. A piece of living folk art and shrine to God that was built and currently maintained by a 93 year old reverend and his wife. 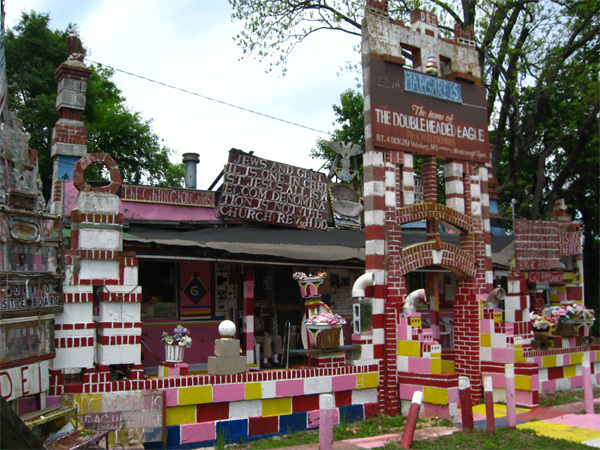 As we pulled up to the pink, red and yellow painted, cinder block structure, we couldn’t help noticing the biblical proportion of hand-painted signs and newspaper articles that decorated the outside. The signs read: GO TO CHURCH and READ THE BIBLE among other suggestions. There were two very old people sitting on the porch, so Dennis politely asked if it “was okay to take a photo?”. They said sure and added that usually people leave a donation for the lighting bill – the cost of god-light is great! Of course! So Dennis gave them a few bucks and they invited him into the house. 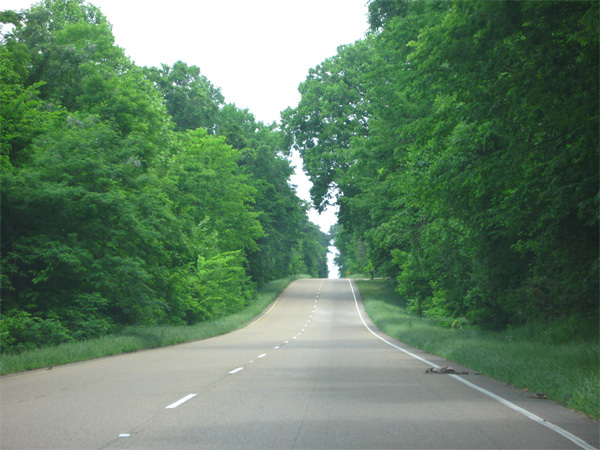 After that, the rest of the drive seemed to be pretty uneventful and route 61 between Vicksburg and Memphis was a bit longer as well. We did however see the high waters of the Mississippi that were reaching tree tops and the tops of street signs. Other frequent sightings were great open plains of farm land, tractors driving along side of us and a massive amount of road kill. We finally arrived in Memphis! After getting checked in to our hotel we poked around the city to get our bearings, and of course hoping for an Elvis sighting. 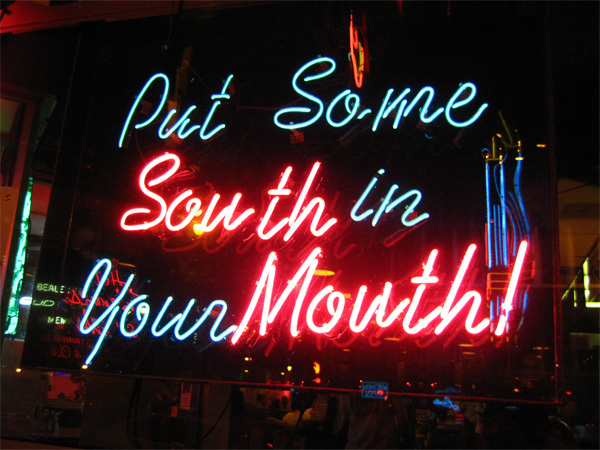 Beale Street is pack with glorious, neon signs. This was my favorite. Oh my, could we be in luck? Down towards the end of Beale Street we could see the Living Dead walking about the street… surely a prime location for an Elvis sighting! Right? 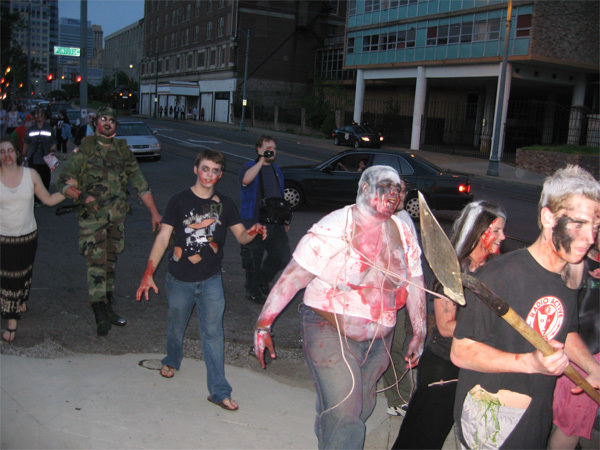 We followed the zombies down main street and into the South main district which turned out to be the arts district. The locals there were having several wine and cheese-style, open houses throughout the galleries. This scene mixed with the roaming zombie parade along side bands playing on the sidewalks made for a very lively evening. We joined them, drinks in hand, parading down Main street along rotting, walking, corpses and fake-blood, drenched dogs. Still, if you can believe it, no Elvis in sight. During all the action we did find time to have dinner… of course! 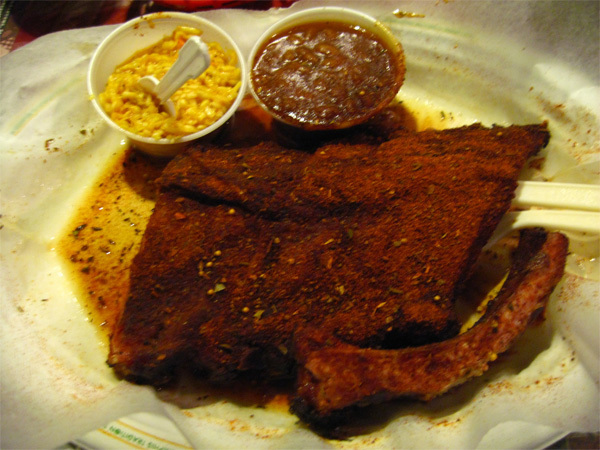 We went to the famous, local rib place called “The Rendezvous“. The chef here is famous not because of his BBQ but rather his anti-BBQ, I guess you could say. He uses a rub instead.They call it dry BBQ. Needless to say it was yummy, juicy and spicy (but not the yummiest we’ve had). I had the chicken (done the same way) and Dennis sampled the Pork Ribs. Dennis gave me one of his ribs… ahh! 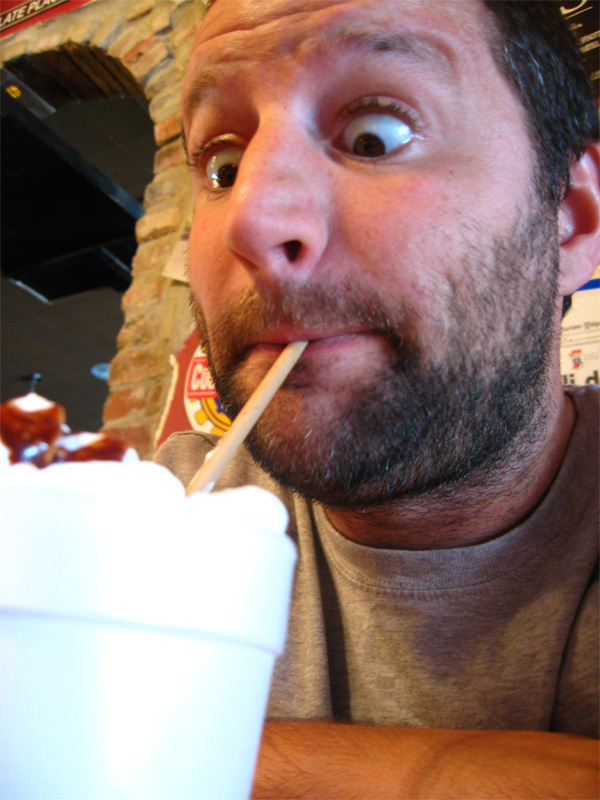 God, Elvis and Zombies all in one day – wow! Graceland here we come!